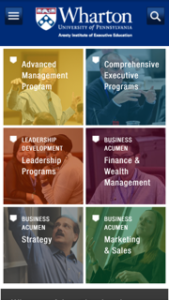 Do a Google search for “executive education programs” and you’ll see the home pages appear for programs throughout the country with high brand strength: the Kellogg School at Northwestern, the Wharton School, the Harvard School of Business, the Stanford School of Business, the Darden School at UVA, the Ross School at University of Michigan, Columbia Business School, the Yale School of Management and the Fuqua School at Duke. In that order. What you’ll also see is that only one places available programs in the prime top-of-page space as the home page opens: the Wharton School at Penn. Scan the topics and follow the links from an area that interests you and you’ll see the upcoming courses over the next several months.